One of my unofficial missions in life is to climb to the summit of Longs Peak and its adjacent peaks in as many different ways I can imagine and am physically capable of completing. In this quest, I count “significantly” different route (vs. completely different) and different seasons as “different ways” so the possibilities are nearly endless. It isn’t a list I expect to complete. Instead, this mission just adds a bit of drama to an already dramatic peak, which is also my favorite peak: Longs Peak. The core of the Longs Peak Massif is what I call The Great Cirque: the semi-circle of rock around Chasm Lake formed by Mt Meeker, Longs Peak & Mt. Lady Washington. And since they are within the semi-circle, I also include the Ships Prow, Glacier Ridge, and The Loft. 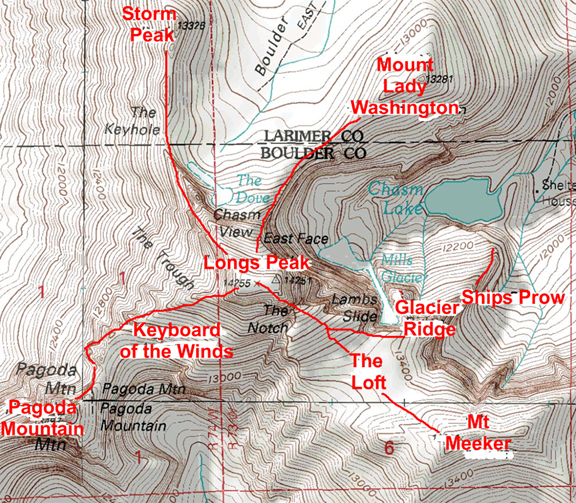 Beyond the Great Cirque, the Longs Peak Massif arguably includes the following peaks and terrain features: Storm Peak, Key Board of the Winds, Pagoda. And that is where I draw the line to avoid being drawn into including every peak in the Front Range. I’ve broken down the various climbs into categories of “difficulty” simply because I couldn’t think of any other manner that would make sense. I’ve also noted when a climb was a repeat done simply because it was fun enough to forgo progress on my mission. Not all of the trip reports are ready; but I’m working as fast as I can.